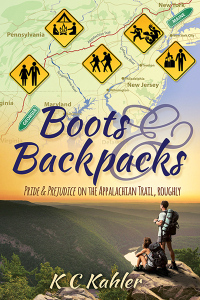 Way back when I had the idea to set a modern Pride and Prejudice story on the Appalachian Trail, I didn’t know how much the setting would shape the story and the characters. But that’s what the Appalachian Trail does: it transforms people. In honor of this great American resource, I thought I’d highlight some of the AT’s history. The Appalachian Trail was first conceived by a forester and conservationist from Connecticut named Benton MacKaye. In an article published in October of 1921, he detailed his idea for a grand trail that would connect a series of farms and wilderness work/study camps along the ridges of the Appalachian Mountains. Two years later, on October 7, 1923, the first section of the trail was opened from Bear Mountain west to Arden, New York. More and more sections were added over the years, however commercial and residential development often threatened not only the actual path, but the scenic value of the areas around it. On October 2, 1968, President Lyndon Johnson signed the National Trails System Act “to promote the preservation of, public access to, travel within, and enjoyment and appreciation of the open-air, outdoor areas and historic resources of the Nation.” The AT was officially designated the Appalachian National Scenic Trail, a continuous footpath from Maine to Georgia under federal protection. Today the AT is one of 30 National Scenic and Historic Trails around the country. For more information about the history of the Appalachian Trail, visit the Appalachian Trail Conservancy website.